I love infographics and I can see exactly why they are becoming more and more popular! They’re an amazing way to provide people with large chunks of data in a visual, digestible, form. Whilst there’s nothing wrong with wanting to create your own, people forget that it’s not a simple process. In order to create a memorable infographic you need to think carefully about the content and design. If you’re thinking of creating your own then great! But before you do, here are some tips & tools to get started. First thing’s first, make sure that your idea is one worth sharing! It’s all about providing your audience with knowledge that they need. People use infographics to absorb, complex information, visually. So try to provide your audience with statistics that they, otherwise, may not have know. Avoid selling your product – this is about producing valuable content. TIP: Take the time to listen to your audience first. If you’re constantly listening you will find a topic that’s suitable. Tools such as HubSpot, Hootsuite & Sprout Social really enable you to gain an insight into your consumers needs. If you want to create a quality infographic that your audience will love, remember that it’s all about them. There’s nothing wrong with getting some inspiration from others! Take note of what people have done well, and even learn from their mistakes.If you do, however, come across an infographic that you love, don’t out rightly copy it! You will probably end up creating a slightly weaker version of the original (in an attempt to make it different). Think of industry questions that need to be addressed and answered. Remember – infographics are teaching tools. TIP: Create a folder, a Pinterest board or save your favorite infographics on to Pocket. Find a safe place to keep great examples! This can be pretty tricky, but it’s not impossible! On one hand, you need enough data to create a useful infographic – it has to be engaging. Yet, if it becomes over-crowded your audience won’t be able to make sense of it. If you have a lot of stats to choose from then great! But remember that you don’t have to use all of them. Use the most relevant & interesting. Here’s an example of having too much (ironically this is also about infographics!) What’s wrong here: – Too much information – No clear design – No headlines or stand out stats – 100% text – you need images too! On the other hand, if your idea is superficial, you won’t have enough information to create a valuable infographic. You’ll be creating something with very little substance. Don’t just create an infographic because they’re ‘in’, make sure that you have something worth saying. Or even worse, don’t spoil what could potentially be an amazing inforgraphic by rushing it. If you haven’t found all of the resources, take the time to do some extra research. I promise – it will be worth the wait! TIP: If you cannot explain your infographic in one sentance the idea is too complex. Your title should pretty much summarize it. Instructions made fun! The design is consistent, clear, and all of the facts stand out. Now this is interesting… an infographic resume! Yet, with its clean, and well organised, design, it absolutely works! TIP: You know your idea inside out so your overall perception of it will be skewed. Get someone who knows nothing about your subject matter to read the infographic. If they can’t make sense of it, there may be a fault with the design or the information. 5. Check Your Facts – Accuracy is Key! There’s nothing worse than trying to provide people with useful statistics only to find out that they’re incorrect. Always use reliable sources & double check the accuracy of your findings before presenting them to the world. TIP: Double check your stats with other more than one source. If you aren’t certain that it’s reliable don’t use it. If there are certain statistics or trends that your audience needs to see, make sure that they’ve been highlighted and enlarged. The clearer and more eye-catching they are the more likely they will be drawn to that information. TIP: Take into consideration both the size and colour of the text. If it is something that must be seen, use a striking colour too! 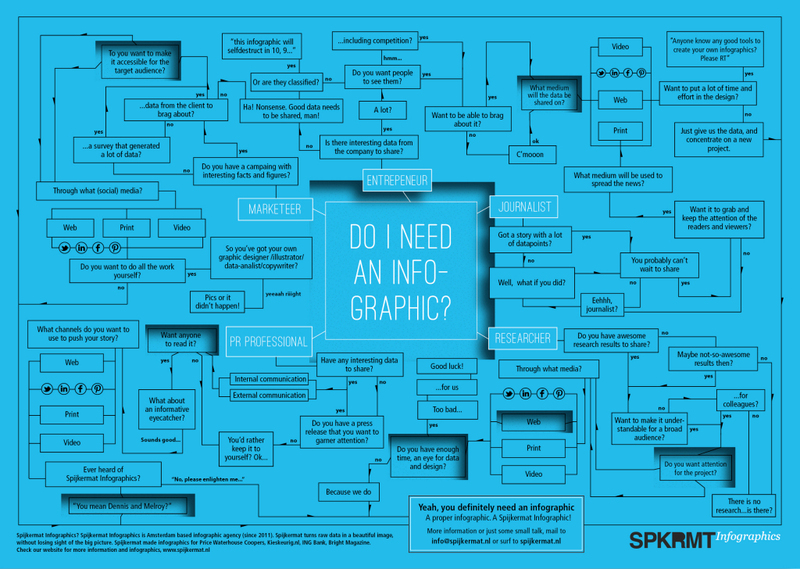 Now that we’ve run through the dos and don’ts for content and design, lets move onto the tools to help you build an awesome infographic!